Must U.S. Navy Downsize Plans? The U.S. Navy is set to shrink. Can it meets its goal of a pivot in response to China’s growing military power? Last week, the U.S. Navy released its annually-updated 30-year shipbuilding plan. The document confirms what analysts have expected since the January publication of the Pentagon's new Strategic Defense Guidance: the world's leading naval power is no longer planning a major expansion from today's 285 warships to 313 or more, as was expected as recently as last year. Instead, the U.S. combat fleet will slightly shrink to a low of 276 vessels in 2015 before modestly expanding, peaking at a planned 307 ships in the late 2030s. Lower shipbuilding rates account for the smaller projected fleet. The Navy anticipates buying between seven and nine warships during most years, while retaining most vessels for around 40 years of service. The cuts are inconsistent with the Obama administration's much-touted "Pacific pivot," says Mackenzie Eaglen, an analyst with the conservative American Enterprise Institute. "This is a pivot in name only," Eaglen wrote at AOL Defense. But the Navy is shifting a greater proportion of its forces to the Pacific while reducing its Atlantic presence. By 2016, seven of 11 aircraft carriers will Pacific-based, up from six today. The Navy has signed an agreement with Singapore for forward-basing of a portion of its new fleet of small Littoral Combat Ships. The smaller size of the future U.S. fleet belies its potential combat power and superiority compared to rival navies. The deepest cuts are to smaller amphibious ships and unarmed support vessels such as catamaran transports and logistics vessels. The Navy plans to sustain a force of 10 to 12 nuclear-powered aircraft carriers, nine or 10 large-deck assault ships and around 48 nuclear attack submarines. Under the new plan, the number of destroyers actually increases. "It is important to remember that, as much as the U.S. battle fleet has shrunk since the end of the Cold War, the rest of the world’s navies have shrunk even more," then-Secretary of Defense Robert Gates said in a 2010 speech. "So, in relative terms, the U.S. Navy is as strong as it has ever been." The Russian navy has suffered the most. From its Cold War peak, the Russian fleet has been reduced to a mostly coastal force with only a token ocean-going capability. The Chinese navy — America's biggest Pacific military rival — isn't significantly expanding. 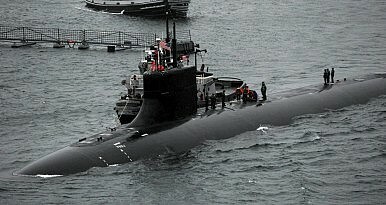 After a period of rapid growth in the middle part of the last decade, the People's Liberation Army Navy (PLAN) has slowed production of submarines and destroyers and is now focused on replacing older vessels with equal or smaller numbers of newer, more efficient models, while also adding niche amphibious and aviation capabilities. The overall Chinese fleet is projected to remain at around 150 large warships over the medium term, according to the U.S. Congressional Research Service.